Lithuanian designer Agne Kucerenkaite reveals the value of industrial metal waste in her project Ignorance is Bliss, which sees the material used to make colourful ceramics. Kucerenkaite developed the project while studying Design Academy Eindhoven last year and it is now shortlisted for Dezeen Awards. 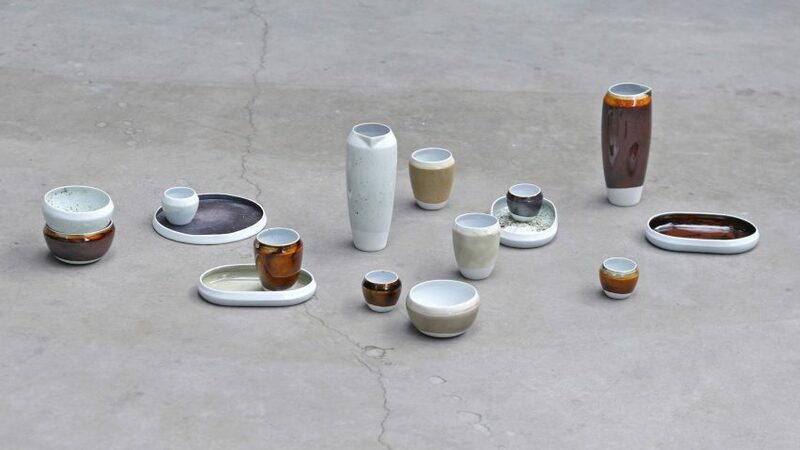 Aimed at promoting a circular economy, it explores how industrial metal waste can be turned into powdered dyes, which can be used to colour porcelain tableware and ceramic tiles. According to the designer, soil remediation companies generate around 30,200 tonnes of metal waste per year, yet the ways to deposit metal waste are limited. Some of it is mixed with concrete in the construction of new roads, but much of it ends up in metal dumpsters, as it cannot be burned. "The era of the industrial revolution was a time in which possibilities of what man could produce seemed limitless," said Kucerenkaite. "No thought was given to the potential side effects of industry; indeed no knowledge of them existed at the time." "As a result, many heavy metals were allowed to pollute vast areas near production sites," she continued. "There is an abundance of waste material available for experimentation at no or little cost. Metals are crucial to our world, and, unfortunately, a non-renewable resource." Kucerenkaite gathered raw materials from industrial facilities, including a soil remediation company, a water purification and treatment plant called Aquaminerals. She also sourced some from an area in South Holland that has been polluted by a zinc factory. The metal waste comes in the form of "sludge", containing a mixture of mainly iron, as well as manganese, aluminium, magnesium, barium and zinc, depending on the location of the factory. While no extraction is required, the sludge has to pass a process of preparation of being dried, milled and sieved before it can be used as a pigment. Instead of using metal oxides, which are usually prepared industrially, Kucerenkaite uses these pigments to create her spectrum of ceramic glazes. Different colours can be achieved depending on the concentration and quantity of pigment – if 10 per cent of waste pigment is added, for instance, it will create a green colour, and if 20 per cent is added the colour becomes more brown. Different metals also colour the glaze differently, for example, iron produces reds, browns, and blacks, while cobalt results in blues, and copper creates green hues. According to Kucerenkaite, Ignorance is Bliss is "not about beautiful objects", but is rather about "an integration of new methods and new systems". She hopes that her project could be adopted on a wider scale, and adapted to the local market as nearly all drinking water companies produce metal residue from water filtration. The designer wants to challenge the mass-manufacturing of current industrial colourings, particularly the construction and fashion industries, and to collaborate with these industries to move towards a more circular economy. Dutch designer Xandra van der Eijk similarly aimed to make people more aware of the effects of chemical waste on our earth in an installation that saw her pour household chemicals onto widely available metal objects. Ignorance is Bliss is shortlisted for Dezeen Awards 2018 in the homeware design category. Winners will be announced in a ceremony in London on 27 November.